Chevrolet has announced that it has been doing some top speed testing on the Camaro ZL1 Coupe at the German Automotive Testing Papenburg GmBh High Speed Oval. 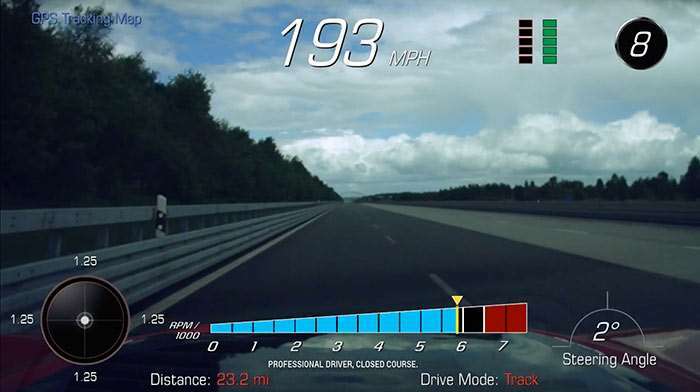 At that oval the ZL1 went 202.3 mph in one direction and 193.3 mph in the other. That gives it an official top speed of 198 mph. The test was conducted with a ZL1 as close to stock as possible. Chevy said that it filled the production Eagle F1 Supercar 3 tires to 44psi and the only deviations from stock were the safety equipment and data logging equipment, which were mandatory for top speed testing. In testing the car reached 60mph in 3.5 seconds and did the quarter mile in 11.4 seconds at 127 mph. ZL1 generated 1.02g max corning and was able to go from 60-0 mph in 107 feet. The LT4 engine in the ZL1 makes 650hp and the car has an electronic limited slip diff, brembo brakes, and magnetic ride control. Pricing for the 2017 ZL1 starts at $63,435.